Here’s a Valentine’s Day-themed card. I created it for a Simon Says Stamp (SSS) flickr group challenge. I just recently joined this group after seeing so many wonderful cards made by its members. Challenges are held regularly with this group and this was the first time I entered a challenge. There are rules for submissions to the group. My card was made using a really bold cling background stamp from Hero Arts called Pebble Pattern. I bought it sometime ago but never really used to its full-on bold potential. I always used the background stamp to create a tone-on-tone effect. Cut a piece of white card stock (Neenah Solar White 80lb.) to 4” x 5.25”. Ink up the Hero Art background stamp with Versamark ink and take the paper face-side down and place it on top of the inked background stamp. Rub your hand evenly and firmly over the backside of the cardstock so that you get a really good impression. Sprinkle white embossing powder over the inked image and heat emboss. Use the emboss resist technique on the heat embossed image. 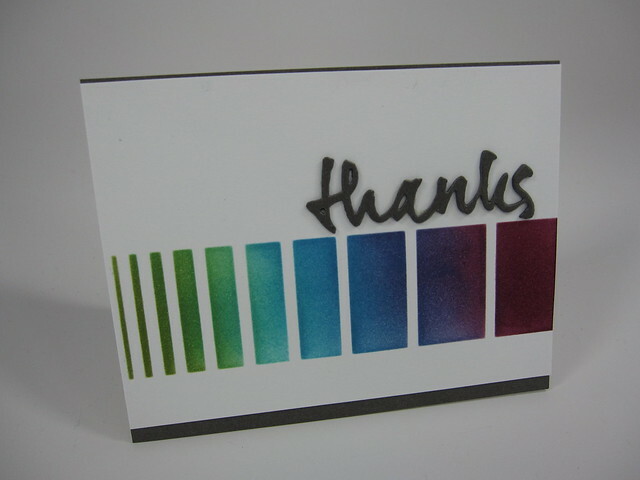 For this card I used Distress inks in 3 colors, from darkest to lightest: Fired Brick, Barn Door, and Worn Lipstick. I used the Ranger mini round ink blending tool to blend the colors working from the top of the cardstock down to the bottom to achieve a blended ombre look. A circle using SSS Stitched Circle die set (the largest one in the set) from vellum paper. 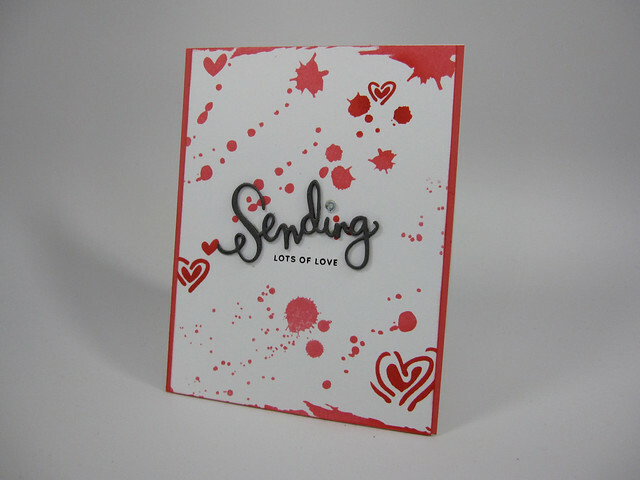 “Love You” sentiment from Stampin’ Up cardstock in Real Red. This was cut 3 times and then adhered on top of each other to give the sentiment dimension. Different-size small hearts from the SSS Mini Hearts die set were cut 3 times as well and adhered on top of each for dimension. I glued the “love you” sentiment onto the vellum circle using my Zig glue pen. 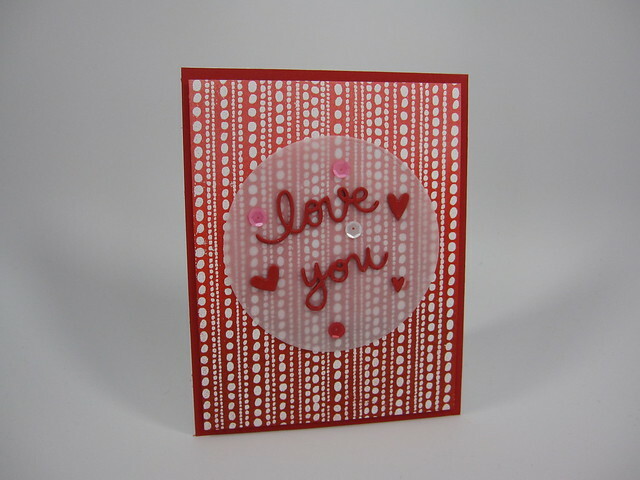 The hearts and sequins were added around the sentiment using the Zig glue pen. I glued the vellum circle to the dotted-background piece with small glue dots. The glue dots were placed on the back of the vellum, behind the hearts and sequins so they wouldn’t show through the vellum. The finished card front piece was mounted on a 4.25” x 5.5” piece of red cardstock in the same color as that used for the sentiment and hearts. This card front was then mounted onto and A2 top-folding, portrait-oriented card base. Hope you like the card and hope you’ll want to join the SSS group on flickr as well. I haven’t posted in quite a while. The month of December went by so quickly! The Holidays, work and just the business of life made it difficult to post on the blog. While I love making Christmas cards, by the time the Holiday Season ends, I really need a change. So my first card of the New Year is something fresh and bright. As a perk with my Papertrey Ink purchase in December, I received their freebie stamp set, Pretty Petals. It is a small, sweet, graphical stamp set. It’s just the thing to cheer me up and take my mind away from the harsh winter we are heading into here in Chicago. I stamped the flower and leaf images from the Pretty Petals set in Hawaiian Shores and Simply Chartreuse, respectively, onto an A2-sized piece of Neenah Solar White 80lb cardstock. The center of the flower was stamped in Harvest Gold. Onyx Black Versafine ink was used to stamp the sentiment. However, after looking at the image, I thought it need a little something to make it less plain, so I stamped dots from a WPlus9 stamp set in the same color ink that I used for the leaves. The dots seemed to make the eye travel across the image. I also added some sparkle to the dots using my Wink of Stella pen in clear. I later trimmed down the image piece so it would fit as a center panel on an A2-sized woodgrain-embossed piece of cardstock. I love woodgrain embossed cardstock! It adds a bit of texture and dimension to a clean and simple card. I then glued the woodgrain piece to the front of a horizontal, top-folding A2 card base. The card base was made from 110lb Neenah Solar White cardstock. If this sounds like excessive layering of cardstock, it’s because I like my cards to have a solid feel to them. I think that feeling of solidity is appreciated by the receiver of the card when they hold the card in their hand. Besides, thicker card bases make it easier to prop up the cards when photographing them! That’s just my preference, neither right nor wrong. Hope this card makes you think of Spring! Supplies used in making this card: Stamps: Papertrey Ink Pretty Petals stamp set, Hero Arts Everyday Sayings (CL342-retired), Borders and Backgrounds 3 stamp set by WPlus9; Inks: Papertrey Inks in Hawaiian Shores, Simply Chartreuse, and Harvest Gold; Versafine Ink in Onyx Black; Cardstock: Essentials by Ellen Woodgrain Embossed, Neenah Solar White both 110 lb. and 80 lb. ; Other: Wink of Stella in Clear.